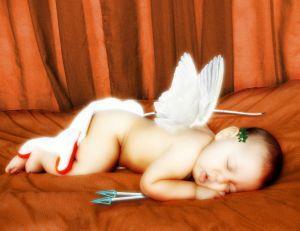 This is the perfect time to capture a cupid keepsake picture. If this is your baby's first Valentine's Day, you will want it to make it very special. Here are some tips on how you can make this day memorable for both you and baby. Every year on February 14, lovers express their feelings on Valentine's Day. Your baby is a product of your love, making baby's first Valentine's Day special. There are many things you can to to make the first Valentine's Day memorable for everyone. Prepare for this holiday by sharing it with others. Begin by creating a Valentine that friends and family will keep forever! Once you have the picture, create a card to send to friends and family. From our cupid! Have a Happy Valentine's Day. Celebrate our love with our little cupid. Sending hugs and kisses from cupid! If you are not very creative, you can use the Internet to create your cards. Sites like Shutterfly make it very easy to customize your photos and make cards. Many of the above titles can be enjoyed all year round. Even though it's your baby's first Valentine's Day, it's OK to spend the evening by yourselves. Happy parents make good parents. Find a sitter and go out for dinner and a movie. If this is the first time leaving baby, don't be gone long. If you are unable to find a babysitter, take baby with you and go for an early meal. You already bought a cute outfit. If all else fails, plan a romantic dinner for after baby has gone to bed. Light some candles and remember what made you fall in love. You can also rent an old favorite movie to watch, like When Harry Met Sally or City of Angels. Making baby's first Valentine's Day special is an easy task. Have fun and follow your heart.